We are excited to announce the launch of the New York City Department of Environmental Protection’s 31st annual Water Resources Art & Poetry Contest. Second through twelfth grade students attending New York City and East or West of Hudson Watershed public, independent, charter or parochial schools or home-schooled students are invited to create original art and compose poetry that reflect an appreciation for our shared water resources. Entries will be accepted online from now until Wednesday, March 8, 2017. Last year, about 1,800 New York City and Watershed students submitted original poetry and artwork, including paintings, collages, three-dimensional models, photography, animation and videos of dance performances, public service announcements, and songs. This year, in celebration of the 175th anniversary of the Old Croton Aqueduct and the 100th anniversary of the Catskill Water Supply System, we have included new contest topics (and resource material) related to the history of the New York City Water Supply System. Harbor Water Quality and Healthy Marine Ecosystems: To discover the richness of our marine life and opportunities for recreation and commerce on local waterbodies; and to understand the work that is being done to monitor and ensure healthy water quality. Art and poetry entries will be judged (in grade categories) on creativity in interpreting one or more of the contest themes, accuracy of information, originality, and skill. Contest winners, called Water Champions, will be announced in April. 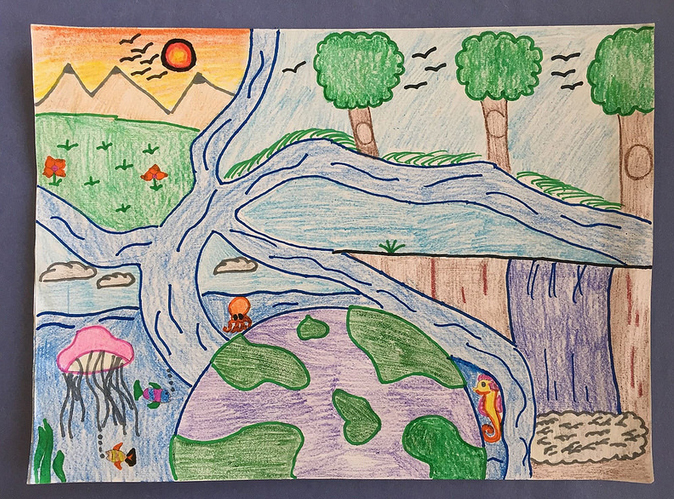 Please visit our website to learn more about the 31st annual Water Resources Art and Poetry Contest, and contact educationoffice@dep.nyc.gov with questions. Thank you. We look forward to receiving all of the wonderful entries from your students this year!